sKNOWflakes and Hand-Delivered on display at the On Thin Ice Exhibition 2016 at Cre8ery Gallery. Mindful Mittens are a each carrying a contemporary message to ponder. Nålbinding is an ancient method of fabric construction which is often referred to as Viking Knitting, due to the fact it has been discovered in numerous Viking archeological burial sites. Hand-Delivered explores current man-made social and environmental issues through the use of ancient craft. WOW! 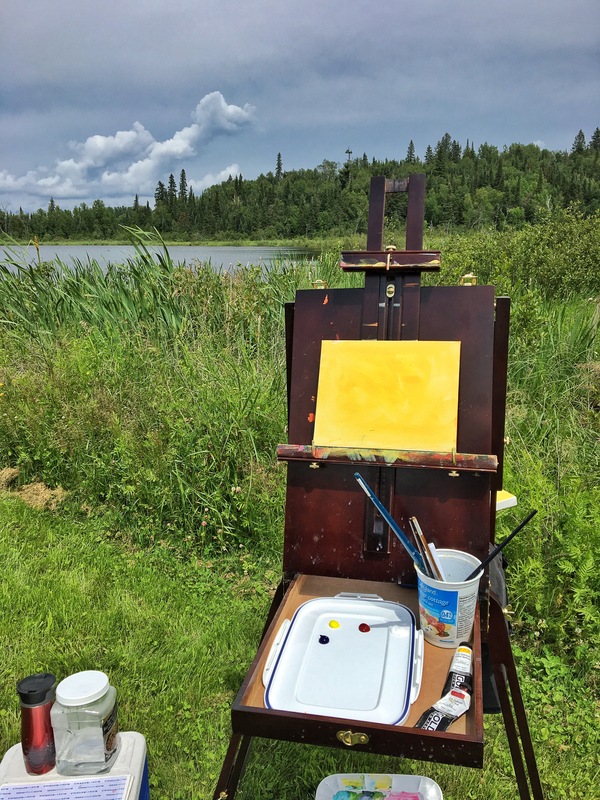 It’s hard to believe more than a week has already passed since I was setting up my easel out at Falcon Lake Trails Resort in Manitoba’s Whiteshell Provincial Park a short 90 minute drive East of Winnipeg to do my first ever ‘plein air’ painting session. Packed up the Jeep and headed to Falcon! Melissa demo’s her process working forground. 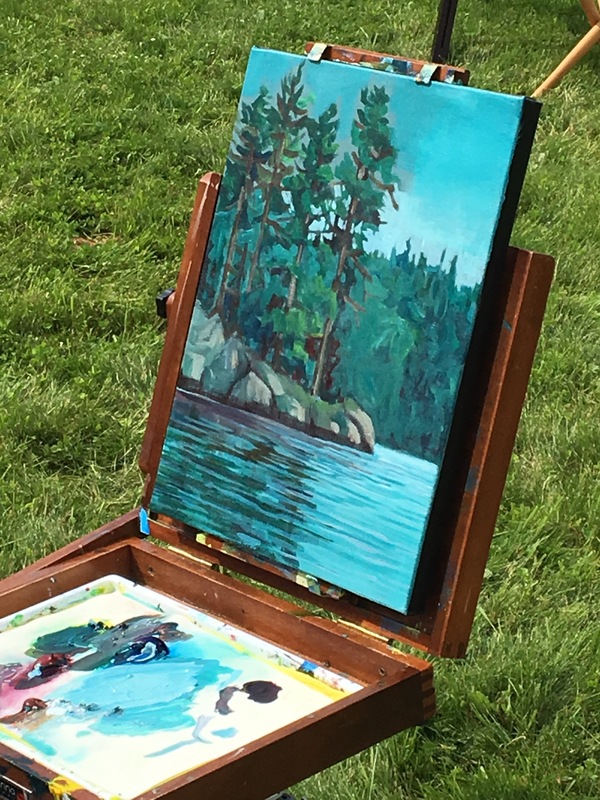 I have drawn on location outdoors a few times with the Winnipeg Sketch Club, but never painted outdoors. Even the few times I have been out drawing in the past, it was never with instruction, so this was a brand new experience and I really enjoyed it. 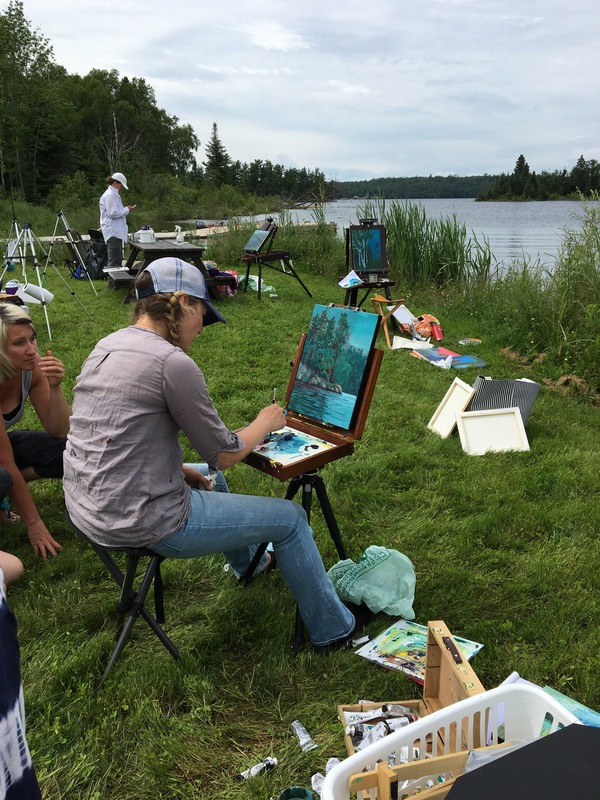 I was fortunate to get one of 15 spots available in the workshop led by Kenora artist, Melissa Jean. 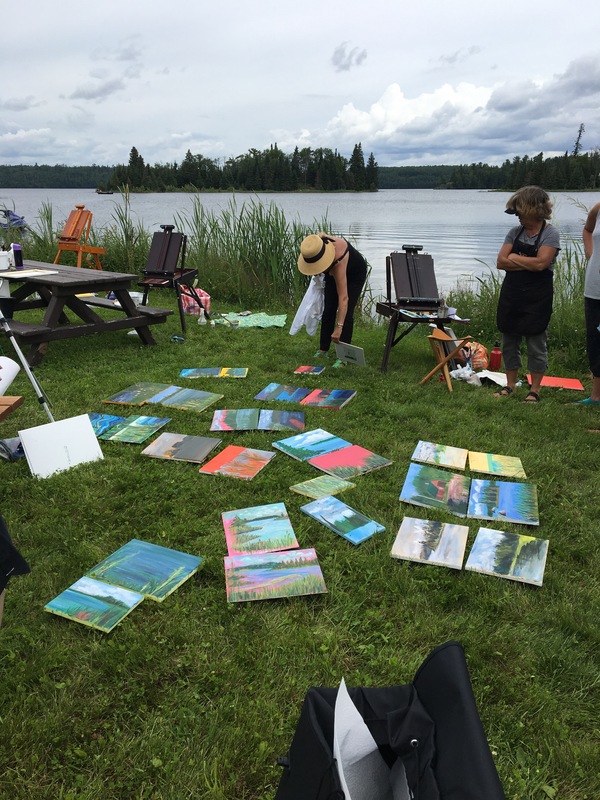 It was truly a fantastic day with GREAT instruction, beautiful vistas to paint, a yummy lunch included, as well as a talented and fun group to paint with….even the weather co-operated! 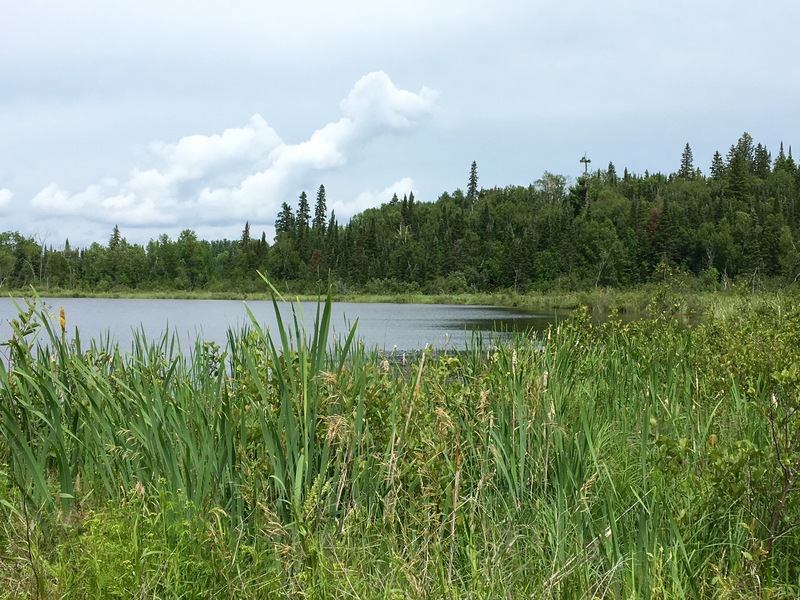 Not too sunny, not too hot, not too cloudy….the perfect Goldilocks kind of day, everything was JUST RIGHT. The day was filled with laugher and motivating challenges to help snap us out of our comfort zones. 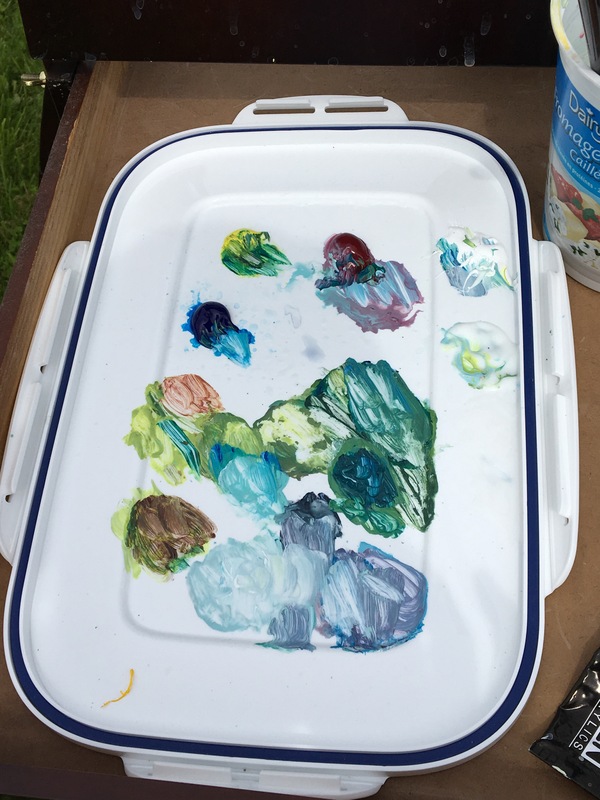 I joined the 37 minute painting club, learned a great deal regarding gear set up and what to bring, as well as some great tips on colour selection and mixing by utilizing a limited palette and mixing cool through warm. limited palette challenge, primary colours plus white and extender medium……and GO! Now I cannot wait to get out side and paint again!! Fingers crossed for this weekend to be nice so I can get some much needed practice in! Visit Melissa Jean Art to view a selection of her gorgeous Canadian landscape inspired works. Thanks for stopping by, happy creating! !